I was working on some boxes and doing a lot of sanding and even with an air filter on, there was a lot of dust in the air. 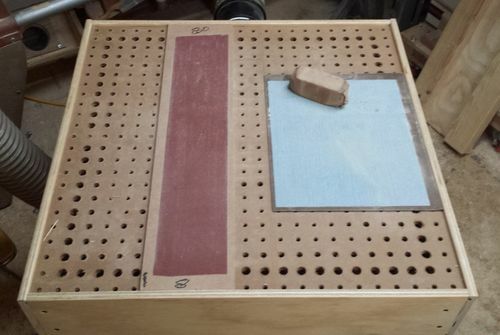 I had a small down draft sanding box but it was not big enough and decided I needed a bigger one. I made the box about 24” square and 6” tall. 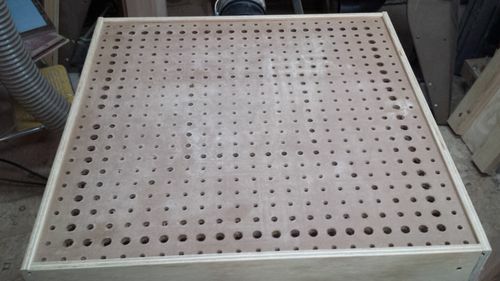 The sides are 1/2” plywood and the top is 1/4” pegboard which originally had 3/16” holes. I got it together and attached a 4” dust collector port on one side. 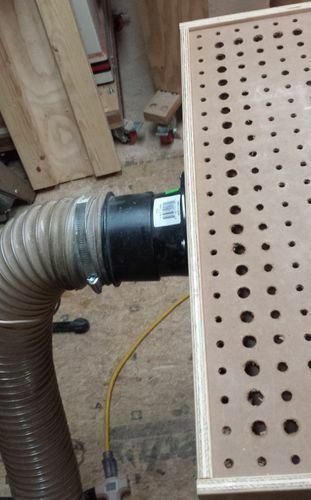 I tried it out with my dust collector and found that it was not pulling much air and I needed to increase the hole sizes. 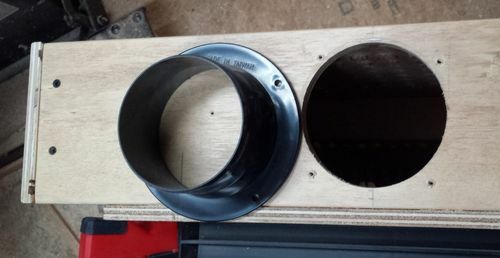 Around the outside, I drilled the holes to 1/2” diameter and also increased the holes sizes in a couple of other areas. The result was increased air flow and better collection of the dust. There is a noticable improvement in the air quality in my shop and very little escaping the downdraft box. I am currently using it to sand some small boxes and needed to be able to sand the lid and bottom flat. I glued some old sanding belts to 1/4” MDF using 3M Super 77 spray adhesive. I also glue up a couple of sheets of sand paper the same way. One note is that I did not put any internal baffles in the box and it works fine without them. I wanted to find out how much air my dust collector was pulling through the downdraft box so I measured the static pressure when the system was running and got about 10.3”. I used the performance curve that I measured on my system and found that I was getting about 600 CFM. little technical for me on the calculations, but from the write up I guess it works well. I have one question, since it’s on my todo list, any excessive flexing in the peg board? I was planning to add dowels to help support the middle. Looks like you have a great idea here. Can you share what size your dust collector is? The motor size, etc.? I have an older dust collector, that’s “okay” but there are times I think I need to make it more powerful. Maybe change the motor size or something… Not sure, but would love to know more about yours. The dust collector is the Oneida Super Dust Gorilla with the 5 hp motor. I guess that I could have mentioned it in the text but it was on the graph. It is a fairly large dust collector and pulls a maximum of about 1650 CFM at 2.5” static pressure. I put one support under the pegboard and it runs across the width. The support is a 1×2 and does not block air flow. I was a bit worried that it would be strong enough but so far there is no bending or sagging. The performance curve was the one I measured and represents the actual numbers for it in my shop. The information on my system and how I measured it are in one of my blogs. 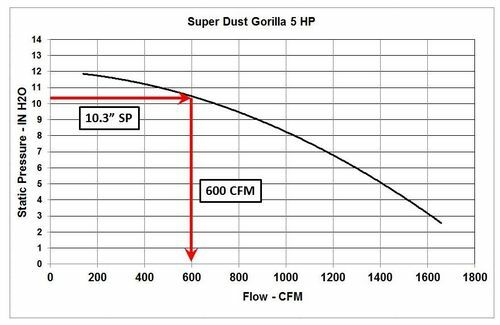 For those wanting to better design a dust collection system, having an accurate performance curve is important. The curve is really fairly simple. As you open more gates or larger gates, the amount of air, CFM, increases and the suction in terms of inches of water decreases. Once you know this curve for your system, you can estimate the CFM by just measuring the static pressure., i.e. the suction. In this case, I used a digital instrument and measured 10.3”. You could also use a homemade water manometer. Once you have the static pressure, you read across the graph to the curve and then down to the CFM axis and find the 600 CFM.